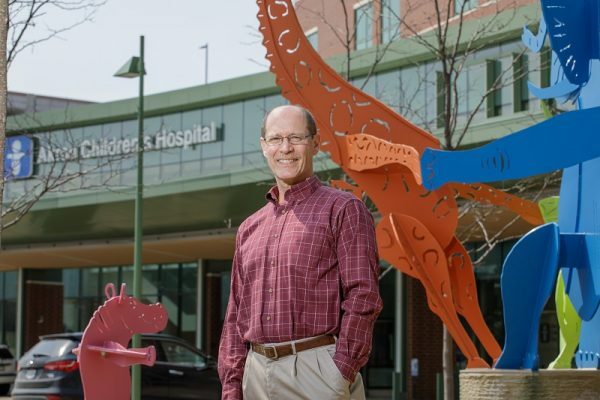 Jeff Sampson first visited Akron Children’s Hospital in the third grade when he had his tonsils removed. Since then, he has come to depend on the hospital’s care and services – from the time his son broke his leg to a more recent injury that required Jeff to receive care at the Paul and Carol David Foundation Burn Institute as an adult. Now, Jeff is thanking Akron Children’s by giving back and naming the hospital as a designated beneficiary of his IRA, with the funds going to the burn center. Beneficiary designations are tax-wise gifts that can be made from retirement plans, life insurance policies or commercial annuities. They create an effective and easy way to establish a legacy that involves no out-of-pocket money. And, as Jeff can attest, the process to name Akron Children’s as a beneficiary of his IRA was quick and easy. Jeff said he’s thrilled to leave a legacy for patients of the burn center. “If this gift impacts just one child or adult in the burn center and provides them some kind of care they may not otherwise been able to have, then I’ve done my part,” he said. 1. Contact your plan administrator. 4. Call Maureen Katanic, senior director of planned giving at Akron Children’s, to alert the hospital of your plans and to ensure your gift will be used according to your wishes. You can reach Maureen at 330-543-8343 or mkatanic@akronchildrens.org. 5. Celebrate your legacy of helping children get well and stay healthy.